TAST stitch for week 10 is Chevron stitch. As usual follow the link for a tutorial and eye candy. Chevron stitch is an old favourite, as I find myself turning to this stitch more and more when I feel stuck for ideas. There is a lot of fun to be had with this stitch. With Chevron stitch you can vary the spacing of the feet and, the height and width of the stitch, to create all sorts of interesting effects. As you can see from the above sample, you can overlay stitches such as herringbone. This sample was created by satitching a line of herringbone in dark blue cotton perle #5 thread. The next journey was creating in Chevron stitch in light blue cotton perle #5 thread. To each of the feet, I added two bullion stitches in wool thread. I used a hand-dyed silk thread to add a fly stitch to the base of the bullion stitches to create what looks like a little flower-bud. Chevron is a great stitch to work back-to-back and then decorate. 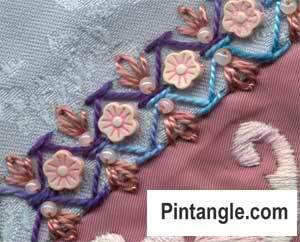 In this sample, 2 rows of Chevron stitch is worked along a seam before decorating with detached chain stitches and novelty beads. 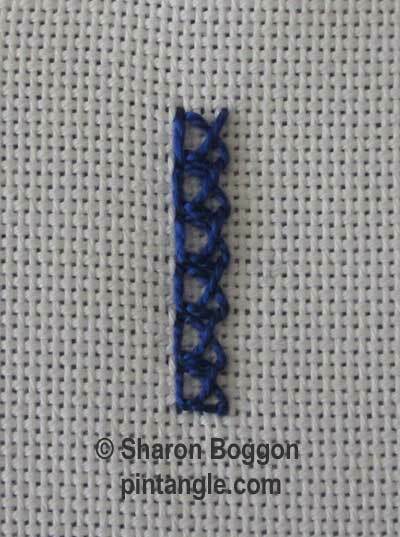 There are many more ideas on how to use this stitch on the Chevron Stitch instruction page. A tip! If you have trouble with tension read my article on How to bind and use an embroidery hoop as it covers not only binding a hoop but, what size to use. The Beyond TAST stitch for week 10 is Inverted Feather stitch. To be honest I cant quite see an inverted anything with this stitch but it is what is called! If you use a thread such a cotton perle Inverted Feather stitch will produce a good wearing edge. I once used it on babies bib and it washed and wore very well. You can use Inverted Feather stitch on projects such as fabric postcards or the edges on pages of fabric books. However is not just an edging stitch as you can use it row upon row to create a pattern. So the stitch for week 10 is one of those handy stitches that not everyone uses but once you discover it you wonder why it is not better known. As usual visit the Inverted Feather stitch tutorial page for directions on how to work it. If you are new to hand embroidery the challenge is to learn the stitch and share what you have learnt. If you are an experienced embroiderer, enjoy Beyond TAST. Give your work a modern twist and share it online so beginners can see what can be done with a little imagination. Stitch a sample, photograph it, put in online on your blog, or share it in the Take a Stitch Tuesday Flickr group, or in the TAST facebook group or where ever you hang out online. Hashtags are #TASTembroidery and #PintangleTAST on places like Instagram etc. If you have a blog leave a comment on the stitch page In other words either the page for Chevron stitch or the Inverted Feather stitch page. Don’t forget your full web address, including the the HTTP part of the web address so that it becomes a live link. It means people can visit your site and see what you have done. Experimenting with different threads can be expensive, as you would normally have to buy a whole skein of each type of thread. So I have made my thread twisties with a combination of different threads to use in creative hand embroidery. These enable you to try out stitching with something other than stranded cotton. 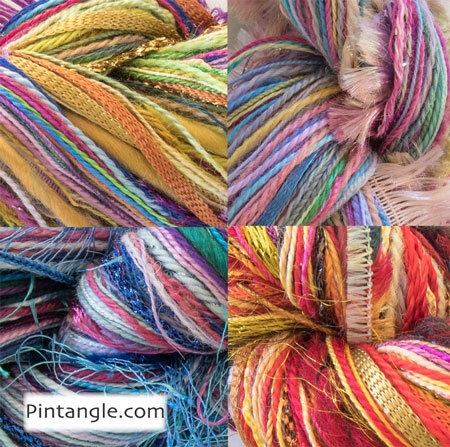 For the price of just a few skeins, you can experiment with a bundle of threads of luscious colours and many different textures.